iCabbi automates as many of your bookings as possible through its automated dispatch system by using the branded taxi booking app, online booking engine, IVR and automated account booking procedures. iCabbi makes your business more efficient with automation that reduces your costs. Perhaps the most powerful automation tool is the customer “App”. Giving customers the freedom to book with your business using a customer app can go a long way towards winning (and keeping) customers. Especially when large “App only” competitors, such as Uber, come to your town. While you personally may feel that your customers ‘don’t like Apps’ and that they “prefer personal contact” – the stats show that when a local cab business gives their customers the option 20% to 30% of customers quickly decide that using the app is what they prefer. iCabbi gives you a feature rich, fully integrated customer App as part of the system, with the App branded with your own business name and logo. 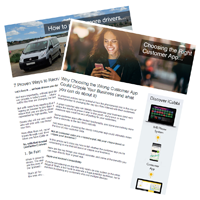 Fact: 46% of iCabbi customers book with the customer app, IVR or web booker. The highest rate is 75%. Despite how much we may think our customers love to talk to us and our operators, the facts prove that a very high percentage choose to use IVR, even when they have the option to speak to a real person. With services like ABOP (Automatic Back On Phone), customers who call back after making a booking (and when it’s in progress) are automatically given up-to-the-moment information such as the driver’s name, vehicle details and wait time. Stats show that over 90% of ‘back on the phone customers’ receive this information this way and don’t need to speak to an operator. This is a huge efficiency gain for you and an amazing experience for your customers. Remember that other features such as DiSC Auto Answer are proven to dramatically reduce missed calls and improve job totals by automatically putting calls through to a telephonist as they come in. The final piece in the ‘automation puzzle’, the iCabbi Web Booker allows you to easily embed a booking engine into your existing website. This allows customers to go to your website on their PC, tablet or smartphone (if they haven’t yet downloaded your customer App) and make a booking via their personal account login. Their booking details are automatically entered into your iCabbi dispatch system, ready for dispatch to your driver. The Web Booker is fully branded for your business and can also be set up as a stand-alone web page if you don’t currently have a website. In summary, by giving your customers the ability to choose how THEY interact with you – you can be relevant to a much wider customer base. From those who want to (and will only) use the phone, to those who are prepared to (and want to) use a great customer app, IVR, ABOP and your Web Booker.